It seems the longer the break, the harder it is to get back to the regular routine. I guess my vacation is officially over now, and the days ahead are getting booked pretty full so it would seem my crazy schedule is back as well. The weekend was quite packed and though I took many photos of some wonderful recipes that I'll be sharing soon, I don't have many photos to show today. 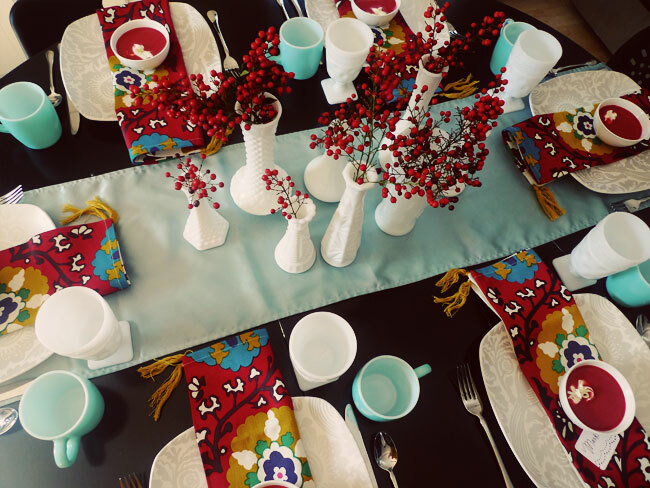 We had a lovely Sunday brunch with some dear friends, and I had fun setting the table and planning the menu. I chose a colorful scheme of red and blue, inspired by my vintage dishware and my new napkins from Anthropologie. I'll update the above with links as I post the recipes. I love this menu because I can do almost all the prep work the day before... all I had to do the morning of was cook the bacon, scones, and eggs. I hope you had a lovely weekend and a very happy new year!